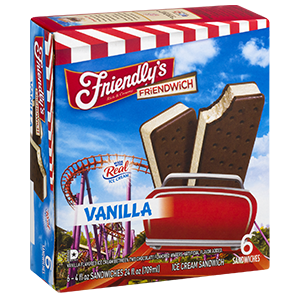 Grab your favorite little helper and cool off with our kid-friendly 4th of July Mini Friendwich Ice Cream Sandwiches! Cut each Vanilla Friendwich in half. Place sprinkles on a plate and coat all sides of each Friendwich half. Insert a mini popsicle stick in each. Just because it's a "Friendwich" doesn't mean you have to share. We wouldn't blame you with all that premium Vanilla ice cream, sandwiched between two chocolate wafers.